THE WAY WITH COWARDS: Deadly missives to journalists who remain unarmed and unafraid. Once again editors at The Sunday Leader are under threat. Last Thursday, October 22, Frederica Jansz, Editor-in-Chief of this newspaper and Munza Mushtaq, News Editor were both sent two hand written death threats by post. The two letters are identical — written in red ink and appear to have been posted on October 21, 2009. 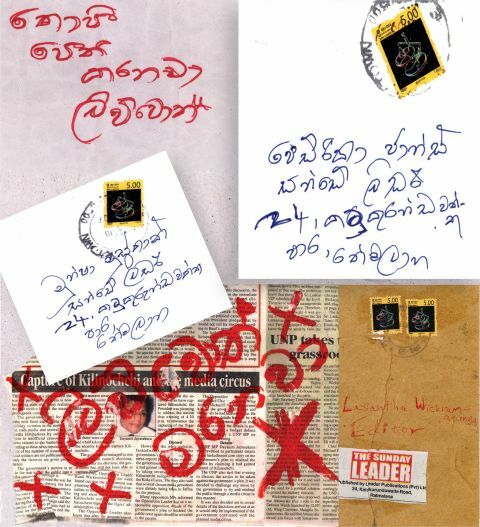 Coincidentally, the late Lasantha Wickrematunge, founder Editor-in-Chief of The Sunday Leader was sent a similar missive — also written in red ink — in December last year, three weeks before he was murdered. This newspaper has consistently in the entire 15 years of its existence come under attack. We have been burnt, bombed, sealed, harassed and threatened, culminating in January this year with the brutal killing of Lasantha Wickrematunge. Not satisfied with that assassination, The Sunday Leader has continued to come under attack. In May this year, Defence Secretary Gotabaya Rajapaksa brought a fresh case against the newspaper and its Editor, Frederica Jansz alleging we were in contempt of an ongoing case in court for having carried a profile on him days after he won the war. Barely two weeks later after we were asked to show cause in Court, five lawyers who appeared for The Sunday Leader in this case of contempt of court were branded ‘traitors’ by the government’s very own Defence Ministry web site. This was followed by another article also posted on the Defence Ministry web site by none other that the Defence Secretary himself Gotabaya Rajapaksa where he reiterated the position of the previous article on the Defence Ministry web site going a step further and accusing the five lawyers appearing for The Sunday Leader as running “to their Nanny” the Bar Association of Sri Lanka. Rajapaksa’s defensive and angry rebuttal followed the BASL and the International Bar Association having issued statements on the incident condemning the actions of the Defence Ministry. This was despite Frederica Jansz having clearly in her interview to al Jazeera stated that Channel 4 – UK should never have aired the controversial video unless and until it had checked the authenticity of the images. However, to the credit of Director, Media Centre for National Security, Lakshman Hulugalle no sooner Frederica informed him of the scurrilous article he had it removed from the web site. Interestingly, though he told Frederica at the time she informed him of the article in question that he had absolutely no knowledge it was even on the site and she had to in fact walk him through the motions to even find it. The Media Centre for National Security functions under the purview of the Defence Ministry. Last week’s death threat to both Frederica Jansz and Munza Mushtaq appears to follow a similar pattern. The Sunday Leader last week on October 18, carried a front page news item which said that in a controversial turn of events, a United States company specialising in forensic services has in a preliminary report maintained that no tampering or editing was carried out in either the video or audio portions of the controversial Channel 4 video clip which showed a man in Sri Lankan military uniform executing civilians. Our story merely reported extracts from the report as well as quoted Minister Keheliya Rambukwella who we spoke to in relation to its contents. The Sunday Leader has been a controversial newspaper because we say it like we see it: whether it be a spade, a thief or a murderer, we call it by that name. We do not hide behind euphemism. The investigative articles we print are supported by documentary evidence. We have exposed scandal after scandal, and never once in these 15 years has anyone proved us wrong or successfully prosecuted us. From us you learn the state of your nation, and especially its management by the people you elected to give your children a better future. Sometimes the image you see in that mirror is not a pleasant one. The journalists who hold the mirror up to you do so publicly and at great risk to themselves. That is our calling, and we do not shirk it. Thank you for your great service to the nation. I am shocked that people still have the courage to send threatening letters to the editors.. One would have thought after Lasantha’s killing the Security would be tight and people would be mortally scared to write such letters. Here in the USA, the police would some how trace the origin. It appears the perpetrators have some support from the Security Forces. I admire for your courage to run this paper, in spite of threats and past set backs. can u say that the letters were actualy sent by someone or created by them to sell the paper? in usa if they somehow trace how can ther be so many unsolved crimes? ref -fbi websites. This is shocking… the Sri Lankan diaspora irrespective of any religiou/ethnicity/caste/region shoule come together and condemn these barbaric acts of the Maharaja and his Junta govt. This is another reason that we have to get Gen. Fonseka on board as Ranil W. is too good for Maharaja. The Leader has a fantastic and a brave team that has exposed many corrupt issues, whichever the Govt in power. The developed world would be proud to have a newspaper such as yours, any time. The under developed banana republics that are run on sheer terror tactics are not ready for you guys ! They are clearly threatened………….these latest terror tactics by goons clearly shows the world, in which direction they intend taking SL and its’ people………..TO HELL ! Are we surprised that we are losing international image even after having thrashed the world’s worst terror group…….on a small military budget………well don’t bash the West, we deserve what we are getting aren’t we? People know who these cowards are and who the real traitors are. Let the Sunday Leader fly high its flag and show it is unafraid and unbowed. The Sunday Leader is the ONLY true news paper in Sri Lanka worthy of reading. The management and journalists are brave and give more importance to the truth than to their lives. The other newspaper is worth mentioning a Tamil daily, Uthayan published in Jaffna, also under threat and was caused damage by the military and paramilitary. If the president also respects freedom of press and professional journalism he must take immediate steps to halt threats and intimidation levelled at the journalists in general and The Leader in particular. Only the head can stop the wagging of its tail. Well, if the current administration did not resort to such murderous tactics, it would be a real surprise. From day one, murdering persons of dissent and branding ones traitors who do not hold the view of the govt was the practise. They will practise it not matter what. There should be some way to enlighten our myopic citizens that a packet of rice and one hundred rupees during election time should not prejudice them to handover this country’s future to tyrants. When will we have that unity? I know that the truth hurts. The sunday leader is the most independant and non-racial newspaper in Sri Lanka. Cant you see that the GOSL is also a bunch of terrorists like the tigers ? I only read the Sunday Leader online and I noted with despair that Lasantha’s picture has been taken off the mast. Why the indecent hurry to erase the memory of my former editor and mentor? Please continue your true service to truth and justice by adhering to the same good values that keep you in the search of justice in Sri Lanka. After massacring more than 30000 tamils in the name of eliminating LTTE in the Wanni war, and worse, keeping still 250000 IDPs in horrible conditions against their will in internment camps, this government has already spread its terror ways to free media in the south. Once they are finished with the free media, they will also ‘come for the sane voices and organizations within sinhala society’ that questions the ways of some government officials. If Sri Lanka needs to be a truly democratic country where race, religion, and other discrimination to be past history, then the efforts need to start now. Carry on with your good efforts and we all know you put your lives on the line for this. But you will always have support from all Sri Lankan expatriates sinhalese, tamils, and muslims who have conscience. its realy shocking. When will end all this. what i see, Domecritic Repablic of Sri Lanka slowly but certainly changeing to Kingdom of Sri Lanka. Any one spoke against the government, he will be a traitor.What domecricey is this. God save Sri Lanka and The Sunday Leader staff. Congratulations! on exposing these crooks. Federica and Munza you guys better take these threats seriously as they will stop at nothing to destroy the Sunday Leader. You post a article raving about a study conducted by a group called Tamils Against Genocide? That group has obvious LTTE connections – Jangi has admitted to meeting with the LTTE leaders to plan strategy. Hence, it’s worthless. The way you gloss it and pamper it into a nice indictment though is pathetic. You’re a pathetic excuse for a newspaper and are traitors. You keep toing the line that pro-LTTE and separatist groups offer portraying them sympathitically while seeking to destroy the government of Sri Lanka. (yes, all your articles you want to dismantle Sri Lanka – because you don’t like its current leader – I don’t either btw) <—That is treason. I will pray to God for your fight. You are among the boldest men walking the planet. Praying to Shiva for Eelam sure worked. Keep praying, jcnars..!! Selfish and Narrow minds cannot see things through a different dimension because their faculty of reasoning is weak or prejudice. Ending the terrorism is welcome relief to the people of the country because it has brought untold hardship to all communities. The government knows well how it ended the war. According to reports unofficial, some thirty thousands innocent civilians are killed by indiscriminate bombing that prompted the 300000 who are in the IDP camps to run into government controlled camps for safety. 1.We bombed indiscriminately in the final phase of the war. 2. We sacrificed thousands of brave soldiers mostly sinhala village boys. 3. we had sacrifice the forward move of the country, all to win the war. Even after great men and material loss we are doing the same and we continue do the same. Have we weeded the seeds that grew to seek Eelam? So far not. we pamper them to regroup later with vengeance. We havent addressed any of the grievance that prompted them to take arms. Rajapakse government alliance with Hela Urumaya is doing everything to ensure that tamil hatred for sinhalese grow day by day. The government has not settled the IDP but it has sent a team of forensic experts to northern area to explore the ruins of some buddist temples. What a pity. Not only that the government wants to build some nine stupas in all the nine provinces. Is this going to help the country or is it going to stir communal harmony? What will the result a new born will tell. I am sure with Rajapakse government. This country is heading to drown. People get united to save this country from another war and from the looming danger. God bless my country and God bless the brave soldiers who save the unity f this country. Keep up the good work Sunday leader team. Ono of the few place where citizen has access to get correct news within the country. You are really great compared to almost monopolistic government biased media promoting round the clock about king & his family along with their boot lickers. We can see thuggery, corruption, commission deals & wastage of countries resources at the peak in the name of patriotism. As the saying goes you can fool the people most of the time but not all the time. King & his family should be made accountable for wealth accumulated during this tenure. The real nacked truth is finally came out. This shameless threat shows the media freedom of this misarable country. This politacally nacked Government is politically impotance to reveal the murderers of Lasanthe Wickramayhunga. Unbiosed people wiss show this Government their political burrial ground very soon. I had a great time reading around your article as I read the topic extensively. Excellent writing! I am looking forward to hearing more from you. I admire you all who risk everything to expose the truth. I am glad to know that there is a source I can trust without unnecessary biases. My respects and admiration to all you Sunday Leader journalists. You make “real” Sri Lankans proud. Don’t be discouraged by these cowards and do what you do best! Off topic, but thought will say it here. This new design is kind of complicated. Please make it user / reader friendly. Comment option is good but i can’t see the comments till i go to RSS. Don’t try WordPress theme hacks. Do a custom designed theme from scratch. Obviously leader can do a better job than this ? Good luck guys. Keep up the good work guys, ur doing a great job. Lasantha is a great guy, god bless him. why dont sunday leader take this death threats to the international community and international journalists associations? This is democracy—Rajapakse style. My late father used to say that you can dress up a pig and bring it to the table but it will always go back to the pigsty where it belongs. So it is with village thugs. This is what happens when a bunch of thugs from a village are elected to govern the country. I used to read the Leader with great interest for many years. However, since the death of Lasantha, you guys are going completely overboard. There is too much speculation. We lived for 30 years under the most ruthless and unprincipled group of thugs who where so blood thirsty that they thought only about power and ill-gotten wealth. They gloated over killing of innocent people. How come none of you have left an element of doubt in the minds of intelligent people that the killing of Lasantha could have been done by the very people who used him? Lasantha thought he was on their side. They could have used him because in doing so it was very easy to pass the buck. These people have been playing both sides. Rajaratnam got caught in New York but he covered himself by giving a few drops to charity to cleanse his name and gave oceans to the LTTE to kill people on the other hand. The Wall Street Journal now has accounts of the deceitful way he operated. He was aggressively making money for whom? He had so much at his disposal from where? The pro LTTErs have played both sides. I have lost trust in all of those who even condemn the LTTE because at some point in their hearts, they will shift to the side that best suits them. A homeland at any cost is what they talk of and when that happens, Genocide, and Discrimination will be a way of life. Until then, they go by plane loads to the “Land of Genocide” claiming to the world and then buy up property. So they have the world believing there is Genocide in the very place they are flocking to and buying land for the future. They know just how to deceive and all of you journalists are falling for the double tongues. If they say Genocide and discrimination is happening now, wait till the proLTTE minds gain ground. They are all in the same game and when we lived peacefully and trusted them, this is what has been going on under our noses. They know that the majority can be bought over by a few good deeds that change judgement. Then they turn around and flip over. Look around and see how many deceitful things have gone on. Look at the boat people. Now it comes out that they had been living in Indonesia for years. The human smuggling is the underlying racket. But do get their ends, they discredit Sri Lanka. They may have killed Lasantha to discredit Sri Lanaka. They didn’t love Lasantha. He was a good pawn to gain their ends. Lasantha may have thought he was fighting their cause. But they saw it as Lasantha was a good bet to get their story told the way they want it. Everyone is playing games and your paper is falling for it. Today anyone can send anonymous letters and do many things to derail the truth. Don’t get political. Get patriotic. We take sides according to the people who plant seeds. We have to now become wiser to see what comes with the seed. Everyone has a hidden agenda. In all of this what we lose is our country. We need to love our country first. I don’t see that in most of those who bash Sri Lanka as if it was a person who was everything bad! It is true our politicians leave a lot to be desired. We can only make the world if we are pure at heart. We spread so much energy spreading hatred. Hatred begets hatred. It makes deeper wounds. Being gallant and showing kindness and finding peace within us is the more human way. After all we are the highest beings in the line of evolution. However, we act worse than beasts. Beasts act like beasts to protect themselves. With us, we attack even when we don’t have our facts straight. Sometimes getting into the mode of hatred and attack goes too far. Even when later it dawns on the human mind that we were wrong, we are too proud to admit our faults. Sri Lankans have huge egos. We probably are the most egotistical in the world. That’s why if someone gets a PhD in one subject they think they have a PhD in all subjects. Education and Qualifications are two separate things. If we are human, education and qualifications will teach us to be more humble and act with more dignity. Qualifications feed egos. Education teaches us to learn that the more we learn, the more knowledge there is to learn and how much more ignorant we are. We are cutting our nose to spite our face by supporting causes that are using us. The Leader newspaper better draw the line somewhere. Stop bashing Sri Lanka and giving publicity to Sri Lanka bashing. We expect better from you as professional journalists. Love your country first. Mr Peace: You have left nothing for me to comment for you wrote the whole thing. Great.